Triptolide is a diterpenoid epoxide which is produced by Tripterygium wilfordii, a vine used in traditional Chinese medicine. 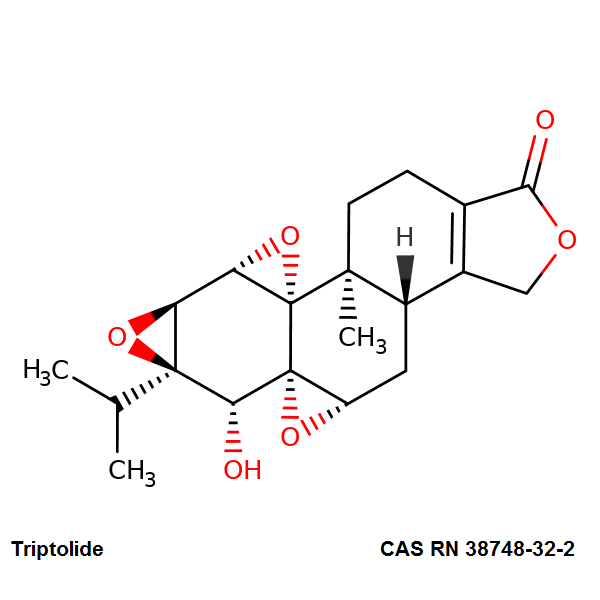 Triptolide has pharmacological activities including anti-inflammatory, immune-supressing, antiproliferative anti-angiogenetic, and proapoptotic activity. It has in vitro and in vivo activities against mouse models of polycystic kidney disease and pancreatic cancer. Shipped in PP / PE bottle. Acute and subacute toxicity studies on triptolide and triptolide-loaded polymeric micelles following intravenous administration in rodents.